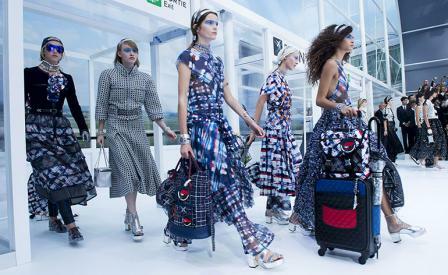 Setting the scene: For spring at Chanel, Karl Lagerfeld set his sights on conquering what is currently the world’s worst place for high fashion: our international airports. Lagerfeld transformed the lofty interiors of the Grand Palais into an indoor airport terminal complete with 37 different check-in desks (sporting both Chanel skirted and hatted women and CC sweatered men), 16 electronic kiosks and a huge monitor displaying incoming flights. The models’ were dressed and accessorised with enough silver metal to keep the world’s metal detectors ringing for the next decade. Best in show: The best looks in this show came out like lightening at the very beginning with a fresh parade of jumpsuits and skirt suits cut from graphic striped and criss-cross tweeds. Also noteworthy, the finale of dazzling crystal embroidered tops and sweatshirts that were worn with paper thin leather long skirts. Finishing touches: Let’s be honest: the Chanel woman is probably flying private and won’t ever have to take off her silk and clear vinyl platform booties, her silver cuffs or even the huge silver plate headbands, and throw them into any pesky X-ray bin. Also fun: Chanel’s chic roller suitcases that can be layered with strap-on signature quilted CC handbags, baseball caps worn backwards and plenty of shiny mirrored rimless eyewear. Watch out, Heathrow!